I work on the eighth floor of a building. 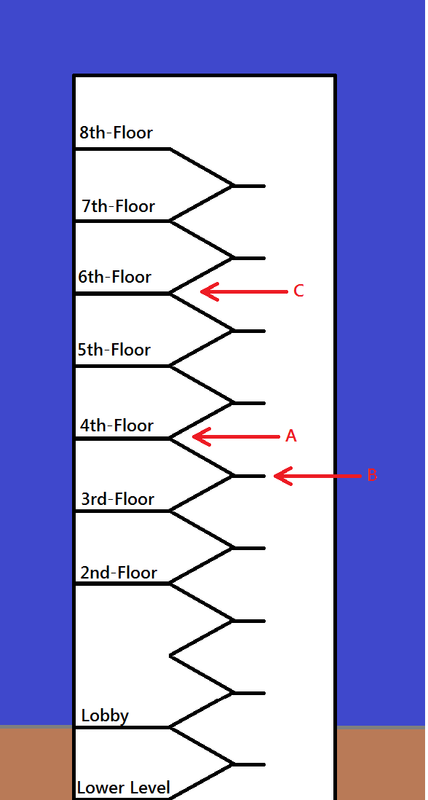 There is a lower level below street level, and the levels from the lowest are called: Lower Level, Lobby (this is the street level), 2nd-floor, 3rd-floor, etc. up to the 8th-floor. The stairwell in the building is a standard reversing pair with a landing in the middle (i.e., there are ten stairs and then a landing at which point one must do a 180-degree turn when walking up to then go up ten more stairs to reach the next floor). There is extra distance between the lobby level and the 2nd level such that in the stairwell there is a complete additional set of stairs (as if there is a story between them) one must climb when traversing between these levels. My question: If I begin on the lower level and walk up the stairs to my floor (the eighth floor), what is the halfway point? Based on the first and second pieces of information, you'd calculate eight flights of stairs from the bottom up and answer "at the fourth floor". This corresponds to point A on the illustration. If you believe that the distance matters more than the ordinal numbering, then you'd answer "at the middle landing between the third and fourth floors". This corresponds to point B on the illustration. If you're thinking like an economist, you'd realize that as I walk up the stairs I grow more tired. The first stair is much easier than the last. In that case you would be wise to answer something like "two-thirds or three-fourths of the way to the top". This might correspond to a point like C on the illustration. I'm not saying any of these are the right answer, and clearly a case could be made for any. But it underscores how reasoning through an answer is as important as the answer itself--even in a seemingly straightforward, "simple math" question like this. So if you're standing at the Lower Level with me and I challenge you to a race "to the halfway point to my floor", you may want some clarification on the finish line. Just don't ask me where the stairs go. They go up.